$672$6 and 72 cents$0.21 / oz. You only have one permanent set of teeth, and its enamel must last you a lifetime. Over the years, exposure to certain substances can take a toll upon the enamel, leaving it discolored with traces of yellow and brown staining. Many things contribute to this discoloration, including coffee, tea, red wine, cigarette smoke, soda pop and even some medications. Stained teeth can be an embarrassing problem, making you reluctant to show off your smile. Whitening products are available to help lessen discoloration, and the key to success with these formulas is finding the right variety to meet your needs. The Listerine whitening mouthwash collection was designed to provide an effective solution for discoloration for people who are struggling to eliminate staining. When you rinse with a Listerine whitening mouthwash, you can treat every surface of your teeth to the beneficial ingredients in the formula, as the liquid can easily travel between your teeth and coat their fronts. This makes the mouthwash an excellent solution for those who have staining between the teeth that is difficult to address with whitening toothpastes, trays, pens and strips. Listerine has a long history of helping people care for their teeth and gums. The first Listerine oral rinse was released to the market back in 1895, becoming the first over-the-counter mouthwash product to be sold in the United States. Because of the benefits and safety of Listerine, the oral rinse has continued to be popular for more than 115 years, and it is frequently recommended by dentists. 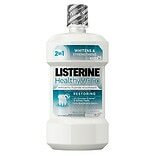 The Listerine whitening mouthwash line was developed to combine the benefits of Listerine antiseptic oral rinse with the power of a whitening formula. The mouthwash products contain hydrogen peroxide, which chemically reacts with surface stains and helps to dissolve their particles. In the Listerine whitening mouthwash, you'll find many solutions to meet your oral health needs, including formulas that bring together whitening benefits and cavity protection or breath-freshening agents. With both pre-brushing rinses and traditional rinses designed for use after brushing, the Listerine whitening mouthwash has something for everyone who is concerned about discolored enamel.